Generation-Skipping Transfer Tax provides all the tools and strategies needed to minimize or eliminate the application of the generation-skipping transfer tax. Written by leading tax practitioners Howard M. Zaritsky renowned author and lecturer on taxation and estate planning issues, Carol Harrington, who has chaired the American Bar Association Committee on Generation-Skipping Transfers, and Lloyd Leva Plaine, former Chair of the Estate and Gift Taxes Committee of the Section of Taxation of the ABA, this excellent reference details their strategies on how to reduce or eliminate the tax an heir might have to pay on an estate. 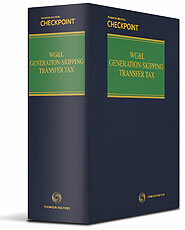 Generation-Skipping Transfer Tax closely examines all options, consequences and possibilities associated with all manner of impositions of the generation-skipping transfer tax, including: the allocation of $1 million GST tax exemption; the drafting of trusts to avoid or minimize the application of the GST tax; the application of GST tax to life insurance trusts, charitable lead trusts, retained annuity trusts, personal residence trusts and various gift trusts, and much more. The Appendix includes sample tax returns as well as practice-proven forms for will and trust provisions that can be customized to meet specific client needs.